AMRO Director Dr. Junhong Chang (left) and Senior Minister of Economy and Finance Dr. Aun Pornmoniroth. SINGAPORE, July 3, 2017 – Cambodia’s economic growth is expected to remain stable in 2017 and inflation will pick up due to increases in fuel and food prices, according to the preliminary assessment by the ASEAN+3 Macroeconomic Research Office (AMRO) after its Annual Consultation Visit to the country from June 21 to 28, 2017. The mission was led by Dr. Seung Hyun Hong, AMRO Lead Specialist, and participated by Dr Junhong Chang, AMRO Director and Dr Hoe Ee Khor, AMRO Chief Economist. Discussions focused on assessing near-term growth prospect and financial stability, policy development, and the efforts on promoting industrial diversification. 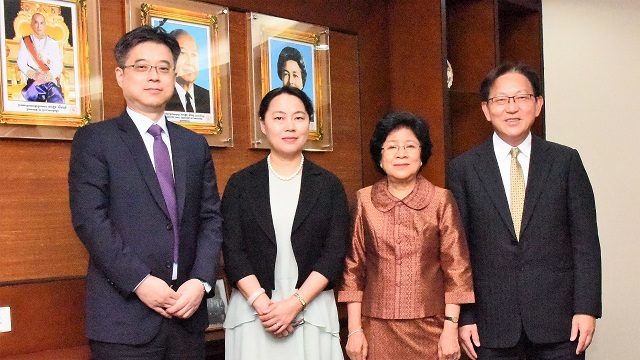 From left to right: AMRO Lead Specialist Dr Seung Hyun Hong, AMRO Director Dr. Junhong Chang, National Bank of Cambodia Deputy Governor Mdm Neav Chanthana, AMRO Chief Economist Dr Hoe Ee Khor. To mitigate the adverse effect of labor cost increases on competitiveness, further efforts are needed in several areas, such as enhancing labor quality, improving trade facilitation, and reducing logistics and electricity costs. As manufacturing industry started to show early signs of diversification, broadening economic base is essential for long-term sustained growth. With monetary policy constrained by dollarization, a comprehensive framework of prudential policies should be adopted to manage risks in the financial system and enhance financial stability. A forward-looking approach with regular bank stress-testing and interconnectedness analysis is strongly encouraged to continue and enhance further. Improving public sector capacity and rebalancing budget allocation towards more capital investment are crucial to enhance growth prospect. In the face of rising labor cost and relatively large infrastructure gap, fiscal policy needs to be more supportive of much-needed infrastructure investment and structural reforms to enhance productivity and support growth. Successful implementation of Revenue Mobilization Strategy (RMS) led to continued strong tax revenue collection and contributed to a declining trend of fiscal deficit for the past few years. Fiscal policy has been prudent as reflected in the sizable current surpluses and the annual cap on borrowing, and this will help to build fiscal space to support economic growth in coming years. Over the medium term, alternative sources of financing should be developed in order to align investment spending with the authorities’ own priorities. This could be done through the development of domestic capital market and continuing partnership with the private sector. With strong support from the Cambodian authorities, the visit has deepened AMRO’s understanding of the current macroeconomic situation in the country. AMRO remains supportive of the authorities’ efforts towards maintaining financial stability while pushing forward various reforms to ensure growth prospects.